Beautiful home located at 10016 E Nacoma Ct in Sun Lakes just listed! Welcome to a Trova model home located on the third hole of the Palms course in Oakwood. Surely, the inside gives you all you need. You’ll find two bedrooms, two bathrooms, den, upgraded kitchen, and high-end flooring. Walking into the kitchen that is upgraded featuring quartz countertops, large island and a large pantry, you’re ready to entertain! Next, you will fall in love with the master suite. A versatile layout that gives you access to the back patio, has a jetted tub, quartz counters, and a large walk-in closet. Step outside at 10016 E Nacoma Ct and enjoy the view. In addition to the beautiful inside, the outside comes with its own amenities. The two-car garage can accommodate a golf cart, features a sports sink, built-in cabinets, and an epoxy coated floor. However, the backyard is where you want to go. North facing and tastefully designed, you’ll be ready to sit and enjoy the Sun Lakes view. Located on a quiet street just minutes from the Oakwood clubhouse with an incredible area to entertain. 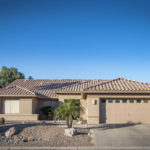 Take a look at our other properties or call us today at 480-440-0849.